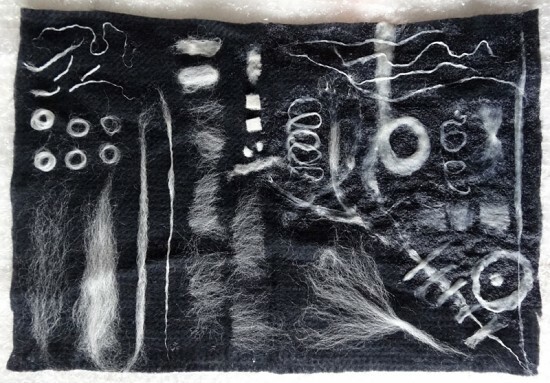 I haven’t worked much with prefelt but I recently got some different kinds to try (from Wingham Wool Work) and these are some exercises I’ve been doing with lines and marks using different prefelts and different fibres. 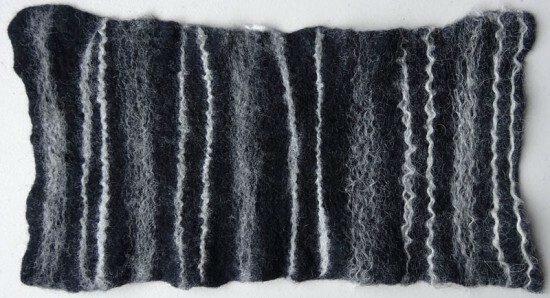 This is Blue-faced Leicester on black Merino prefelt, before and after felting. Some of the fibres were wetted before laying them down, or laid onto wetted prefelt, and these retain more definition, I think. Update: I realised when I looked again at the notes I made for this next one that I had mixed up the order of the first two – it’s Shetland on the left and BFL next (now corrected). This is the same prefelt, but exploring different fibres. Each group of three lines shows: untwisted fibres, dry twisted fibres, wet twisted fibres. From left to right the fibre is: Blue-faced Leicester, Shetland Shetland, Blue-faced Leicester, Merino, Teeswater, Massam. 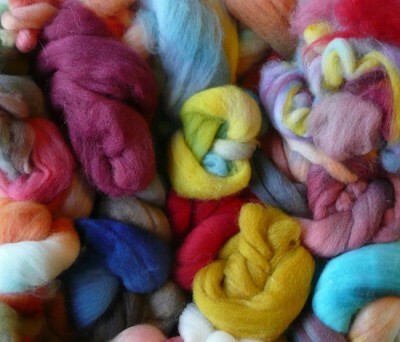 I love using Merino for felting but to be more sustainable I would prefer to find a UK alternative, the more local the better, and only use Merino when nothing else will do. Of these fibres the Shetland BFL has a lovely quality of line and is much less ‘hairy’ than the Teeswater and the Massam, almost as smooth as the Merino. 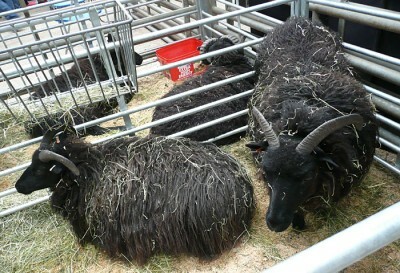 The BFL Shetland is somewhere in between. This is Merino on white Merino prefelt, I do love these lines. This is Shetland fibre on Norwegian prefelt. It’s a much coarser prefelt but I like it more than I expected. 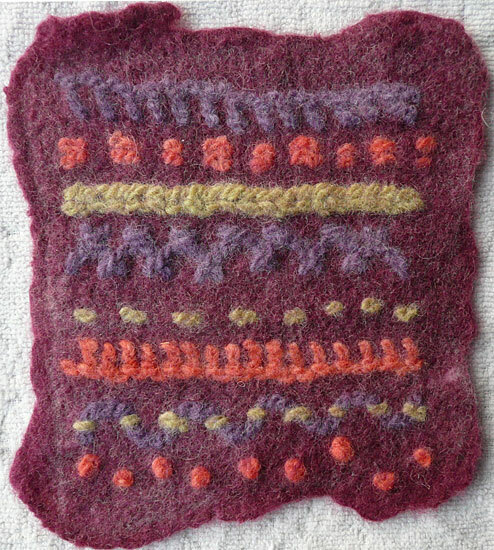 Here I made the prefelt first myself from Merino fibres (because I wanted the colours), laying out the fibres in random directions and then using a version of the dry rolling method described by Treetops Colour Harmonies in Australia. 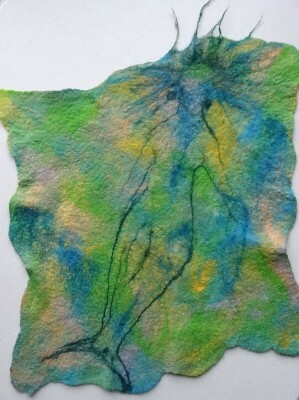 I used Merino for the lines too, dampened and twisted by rolling a little between my fingers. 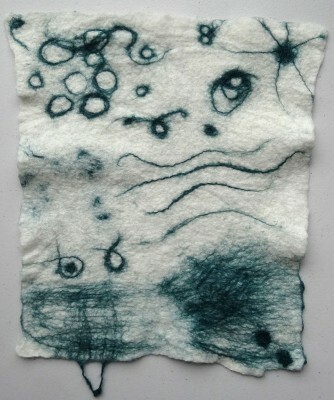 It’s just a small experiment in drawing with felt. I really enjoy the way the line crinkles as the felt shrinks. One of the advantages of Merino, apart from softness and sheen, is the huge range of ready dyed colours. Does anyone have a source for dyed Shetland (and BFL!) tops in more than a few colours? And/or any other breeds to try? Bowmont? I do have some lovely Shetland cross fleece grown here on Tiree, in a couple of natural colours which I’m going to try dyeing myself as well. 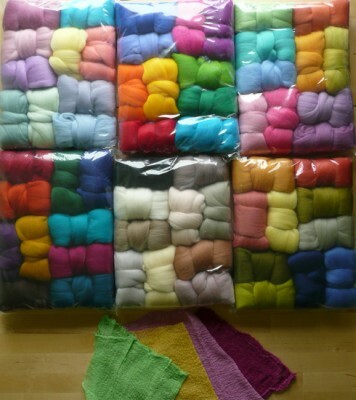 Sorry about the shiny photo – I think it looks so pretty all packaged up I haven’t opened any of the bags yet! Most of the fleece I’ve used up to now has been space dyed, which is wonderful for subtle colour changes but sometimes there’s only a scrap of a particular colour, and I’m always pulling little tufts out of the middle of the tops to get at the shade I want! I’ve looked at various mixed packs of fleece recently, thinking they seem like a good way to acquire a bigger colour palette. In time I’m sure certain colours will be worth buying in bigger quantities but for now it’s more important to me to have a little of a lot of colours than large quantities of a few. However, I hadn’t seen any packs with a range of colours that really excited me till I discovered the lovely rosiepink crafts. Believe it or not, I ordered these at about 11.30pm last Monday night and they arrived in Tiree on Wednesday all the way from the south coast of England. The vibrant coloured fabrics at the bottom are some hand-dyed scrim that Annie and Lyn (aka rosiepink) also very kindly sent along with the fleece for me to experiment with, having looked at my blog and some of the things I’ve been trying out recently! 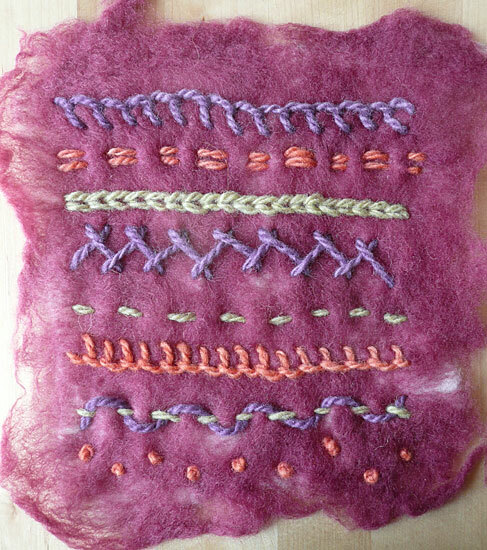 Annie and Lyn’s own blog is very interesting with a number of felt-related tutorials and tips as well as examples of their work – well worth a visit. Although I’ve already posted today, I wanted to write about the Woolfest before I go away or the memory will have faded. It’s a wonderful show – a combination of all the elements of fibre arts – from the animals who provide the wool to the rainbows of fleece and yarn on sale, from tools and books and dyes to so much exciting felt, knitting, crochet and weaving that you hardly know where to look next. It’s small enough to wander round twice or three times in a day, discovering new things each time – and big enough to provide a very satisfying variety of experiences. I met up with my Mum and my friend Julie and we had a lovely day. 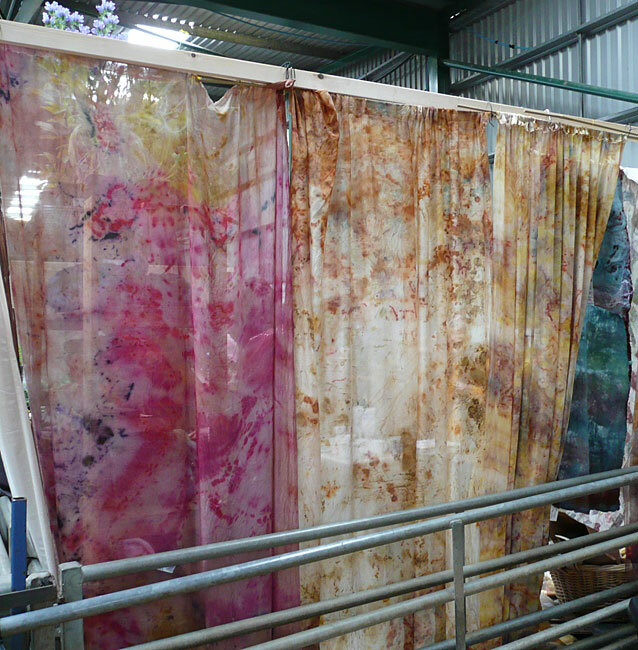 Helen Melvin of Fiery Felts had curtained her stand with beautiful lengths of cloth, dyed by mordanting and then rolling up with bits of earth and flowers and leaves. 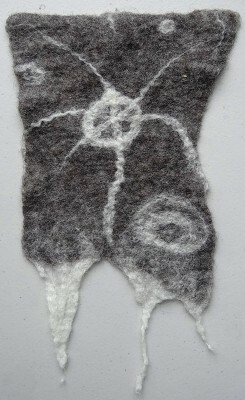 This view is of the back – some of these were nuno-felted on the other side. The Hebridean sheep (these are from Heathland Hebridean in Kent). I bought some of their lovely dark fleece to try dyeing it for felting. 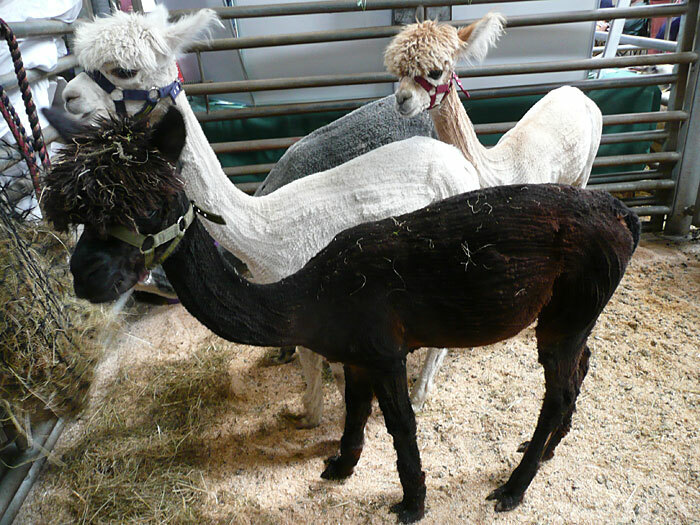 These graceful alpacas from WhyNot Alpacas of Sedbergh – I love their just-shorn textures and the range of colours. These amazing clothes, modelled by young women from Estonia, Slovakia and Cumbria, in a youth project called "From Sheep to Dress" – clothes made by hand, from Estonian Native Sheep wool, by girls from Saaremaa Island. 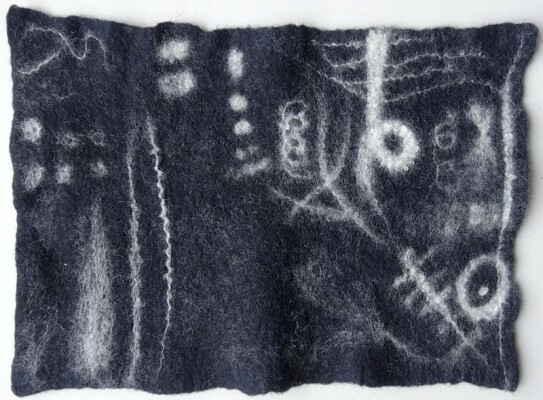 There’s a bit about this (and some of the other exhibitions) at knitonthenet, and I found an image gallery on the web as well. 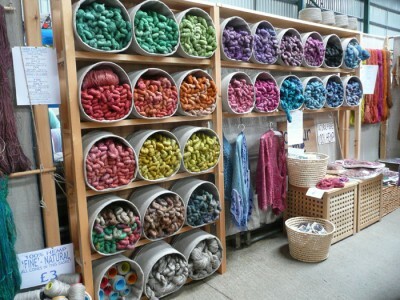 Finally, the gorgeous display of dyed hemp yarns from the House of Hemp. I tried to be restrained but I did add a few lovely things to my stash as well as the Hebridean fleece: some beautiful undyed alpaca rovings in four different shades, a tiny skein of purple hemp yarn, some space-dyed knitting ribbon in rusts and pinks and bronzey greys, Liz Clay’s book on Nuno Felt, and a small felt-rolling mat from Jenny Pepper’s stand. And now I really must go and think about what to pack! 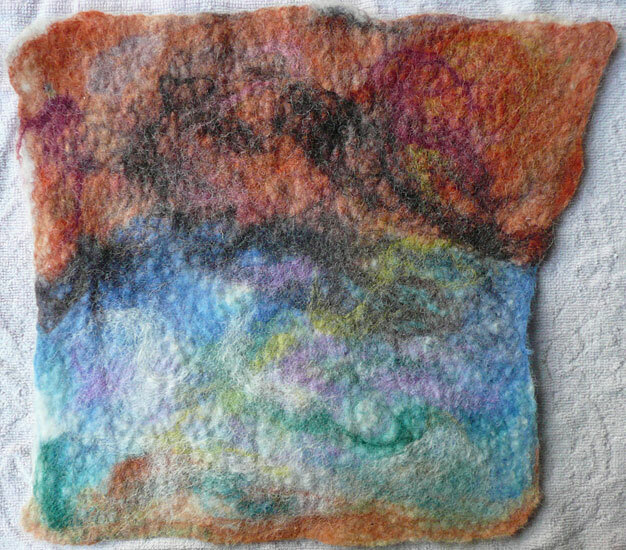 I want to explore this effect some more, but would prefer finer wools for the stitching, I think.Â Then, rather than getting all wet and soapy for one little piece, I also made another piece of felt based on thoughts of the sea at sunset. It didn’t really turn out as I wanted, but it’s all experience.